Tell us about you and your company. How did you get started and what choices led you to where you are now? I’m working for Wehkamp for almost 3 years now. It is an online retailer with the main focus on the ”Dutch families”. Before I have joined the Wehkamp, I was working at a small e-commerce company in the East of The Netherlands as a sys-admin. I got my first experience with Zabbix there. They had Zabbix installed as a monitoring service, but nobody knew how to set it up correctly. It took a while before I felt confident enough to tell the world that I’m not only using Zabbix but also managing it, so I put Zabbix as a skill on my LinkedIn profile. Within a couple of weeks, Wehkamp contacted me and asked if we could chat. That’s how my journey at Wehkamp has started. I met Dennis Kanbier (he’s working at Air France-KLM) on my first day at Wehkamp. 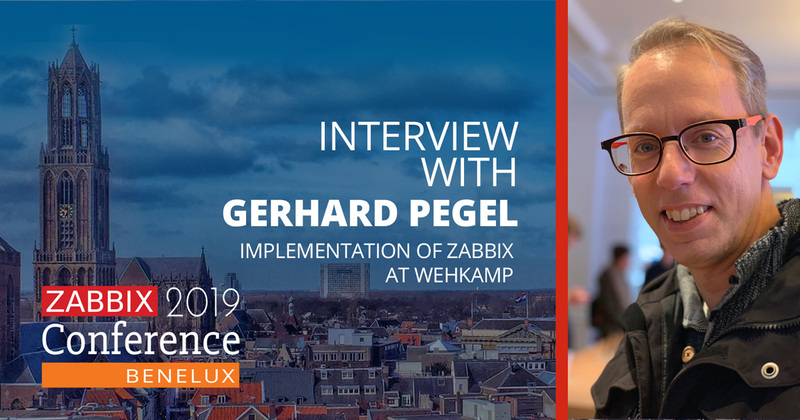 He was working at Lacent (that’s the financial part of Wehkamp) as an external employee, and together we build a complete infrastructure to host the Zabbix front-end, server, and databases. Also, Elasticsearch, Logstash, Kibana, Redis, and Grafana were introduced by us in order to complete the whole monitoring chain for Lacent. Tell us a bit about your projects and how they are related to Zabbix? What kind of challenges have you encountered and what kind of solutions have you found. One of the biggest goals we have reached is the fact that we have enabled other teams to use Zabbix as a monitoring solution. For example, every single morning our team had to check a certain database table, by running a typical query and see if it was filled with 0 or 1. They had to run this query every morning before 8 am. Zabbix allowed us to simplify the procedure. We created ODBC checks in Zabbix, so the process runs automatically now. Another thing we did was creating a bot. Like many other companies, we use the app called ‘Slack’ to communicate with our teams. By using the Hubot framework from GitHub, I was able to create a bot that connects to the Zabbix API. In our case, I could ask our Zabbix server about the current events by using Slack. So now I’m able to grab my phone, fire up Slack and type a command like this ‘Zabbix events.’ When there are any events, it will show me the current one in Slack. When there are no events, I get a reply saying ‘nothing to see here people’ or something like that. With the same bot, we also created a connection to Dollar Universe (from CA Automatic). So, our $Universe team is now able to start, stop and skip the running jobs in our different environments. How did you choose Zabbix to be your monitoring solution of choice and what about it impresses you the most? I did not choose Zabbix, it chose me 😉 No, seriously! Zabbix is not a single monitoring solution we are using in our company at the moment. We are also using SCOM, Prometheus, Pingdom etc. All these tools are used by different teams. For example, our front-end teams use Pingdom, our teams that create microservices are using Prometheus. Server, Storage, and Backup teams are using SCOM. Our roadmap shows us that we are going to replace SCOM with Zabbix and it will be mainly used for monitoring our on-premise servers. What impresses me the most is the fact that you can do almost everything with Zabbix. The disadvantage is that you can do almost everything with Zabbix. And I’m talking about the very steep learning curve of Zabbix. Once you know how the GUI works, there are also a whole lot of CLI commands to use. So when you think you know everything, there are still a lot of things to learn. What would be the key message of your presentation, and what do you want attendees to learn from your talk? I want to show that using a monitoring tool doesn’t stop at Zabbix. Zabbix is the beginning of creating a complete monitoring stack. The integration with Logstash, Redis and Elasticsearch are really great when you know how to set things up correctly. As I said earlier, Zabbix has a very steep learning curve so it can scare some people. Fortunately, there’s a huge fan base of super-excited Zabbix users around the world, sharing their experience and knowledge in IRC channels, forums etc. What topics do you look forward to discussing with the Zabbix community, attendees and the Zabbix team? I am looking forward to getting new features in Zabbix like stashing the history in Elasticsearch (we are playing with the idea to stash really old historic data into S3 buckets). Besides, I’m curious about the new workflow and also the database support. After all, I’m really curious about the Zabbix Cloud. I know, it’s coming soon and I’m waiting for it. Previous Previous post: Zabbix Summit’18. How It Was.